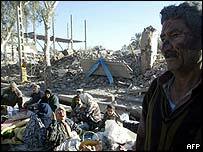 At least 20,000 people have died in the huge earthquake which struck south-eastern Iran, according to officials. Rescuers are working through the night to hunt for survivors from the quake, which struck before dawn on Friday. The ancient city of Bam has been devastated - most of its buildings have been flattened including two hospitals and a 16th Century citadel. A big relief operation is under way, with many foreign countries sending supplies and rescue workers to Iran. President Mohammad Khatami described the quake as a "national tragedy" and said it was too huge for Iran to cope with alone. The United States offered humanitarian assistance, and President George W Bush said he was "ready to help" Iran. Aid agencies are making urgent appeals for supplies such as tents, blankets and field hospitals. But there are immediate fears for the safety of survivors - temperatures at night in this desert city drop to well below freezing, and food and water are in short supply. The country suffers frequent earthquakes, with small tremors happening almost daily. In one earthquake in 1990, 35,000 people died. Bam and the surrounding area is home to more than 200,000 people. About 70% of the houses in Bam have been destroyed, Iranian state television reported. It is thought many people were crushed as they slept. There were scenes of intense grief in the city, with people weeping next to corpses shrouded in blankets. "I have lost all my family. My parents, my grandmother and two sisters are under the rubble," Maryam, 17, told Reuters. Two of the city's hospitals have collapsed, crushing many staff, and remaining hospitals are full. Many of the injured are having to be flown elsewhere for treatment. A huge relief operation involving ordinary Iranians, the army, Islamic volunteer groups and local rescue teams is under way. Rescue teams are flying to the area by plane and helicopter. Emergency centres set up in makeshift buildings are now trying to care for the tens of thousands who have been injured. The BBC's Miranda Eeles in Tehran says that in many places there simply is not enough room. Telephones, electricity and water supplies have been cut by the tremor. A number of countries - including Russia, Britain, Germany and Spain - have offered to send relief teams and supplies. The United Nations said it was sending experts to co-ordinate the aid effort. The Red Crescent is setting up tents to house survivors. Friday's quake had a magnitude of at least 6.3, according to Iranian sources. The US Geological Survey measured it at 6.7. Bam - about 1,000 kilometres (620 miles) south-east of Tehran - was on the Unesco's list of World Heritage Sites. An important regional centre in the 16th and 17th centuries, it contained many ancient buildings that were not built to withstand earthquakes. Since 1991, tremors have claimed some 17,600 lives and injured 53,000 people, according to official figures.